Airplane bathrooms can be disgusting. But I had never heard of a plane diverting due to someone stinking up the lavatory until today. If this article from the Daily Mail is to believed, this week a British Airways flight from London to Dubai had to turn back because of a terrible smell coming from the toilet. Apparently what was supposed to be a brief delay turned into having to wait until the next day for a replacement flight. I’m assuming that there was something wrong with the toilet, and not just a bad smell. On a flight to Vegas, I was stuck in a middle seat in the very last row (my original flight was delayed and I snagged a seat on another flight that was about to take off), right next to the lavatory. At one point during the flight one of the flight attendants put a pack of coffee grounds in the lavatory. She explained it was a trick she learned to cover up/reduce odors. 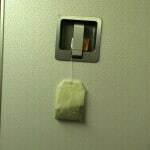 During my first mileage run I discovered a tea bag hanging in the lavatory; either someone was drinking tea in their or it was to cover up smells.